The below artworks are the most important by Sophie Taeuber-Arp - that both overview the major creative periods, and highlight the greatest achievements by the artist. 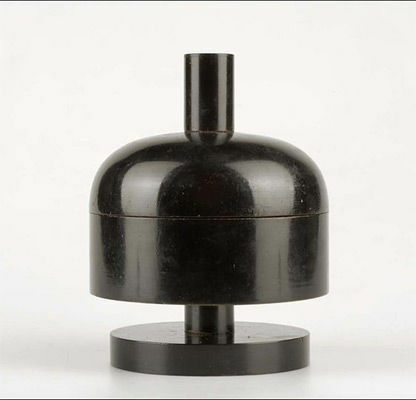 Artwork description & Analysis: This almost-minimal object of turned wood shows the possibility of infusing a functional object with a radical aesthetic. Note the upturned concave shape, perhaps reflecting the Dada belief in the topsy-turvy state of the world. 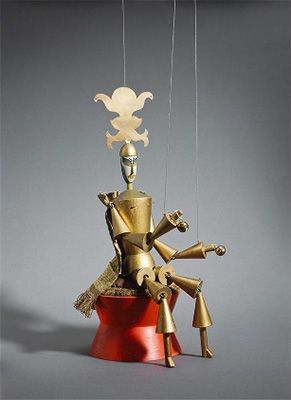 Taueber-Arp applied the nascent Dada strategy of attacking the bourgeois sensibilities of a corrupt world to the decorative arts. This strategy accomplished several goals. The object straddles boundaries: it is representational and abstract, made by hand and uniform as if machine-produced, utilitarian, and aesthetic. At a time when abstraction was in the vanguard and the applied and fine arts strictly divided, this combination made the object impossible to categorize. Furthermore, the sleek upturned bowl translated the simple geometric forms then in vogue in avant-garde fine art into the three-dimensions of the material world, elegantly eradicating the division between art as representation and life. Artwork description & Analysis: Unlike other textiles at this time, Elementary Forms was made to hang on a wall. Treating an embroidery like a painting was an innovation. Taeuber-Arp tried to erode notions about what materials could be used to create art. The obvious weft changes how the viewer sees the decorative embroidery, forcing one to consider its texture and the implication of the hand that made it. Taeuber-Arp takes radical notions of non-representational art and applies their tenets of color and form to traditional woman's work. In this avant-garde pursuit, she is unexpectedly enabled by traditional gender roles. Her position as a textile designer (a female occupation) was an asset because the applied arts were granted more freedom to pursue abstraction (patterns, decorative borders) than the fine arts were, as abstraction was contentious and often unrecognized as art. Designs such as this allowed her to demonstrate her complex understanding of color and shape. 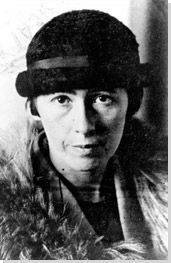 Elementary Forms is one of her earliest Constructivist works. The embroidery shows the complex intermixing of art and design that she pursued without differentiation. The title refers to the language then common in the dialogue around abstraction, which sought to connect to the eternal and fundamental building blocks of the universe. Artwork description & Analysis: This photograph represents the advent of abstract dance in the 1910s. Masks were intended to free the dancer's spirit, and it has been suggested that the costume was richly colored in blue, red, white, and brown as well as silver and gold. The geometric, restrictive forms on her top half make movement ungainly, in contrast to the greater freedom of movement around her legs. Modern dance teacher von Laban had expanded Taeuber-Arp's understanding of dance to include intuitive and abstract movements. These unstructured forms broke from the common language of dance, paralleling the Dada attempt to break from established language and art forms of a flawed and broken social system. Like a noise poem, dance invoked nonsense to counter the established order. In contrast to the aspirations of eternality and monumentality of static works, dance highlights the tragi-comic aspect of Dada. Taeuber-Arp brought Dada's protest to the body dancing under the name G. Thauber. Neutered and made anonymous by the costume, her female body is an absurd protest and a live abstraction - fractured and hobbled like the broken world around her. 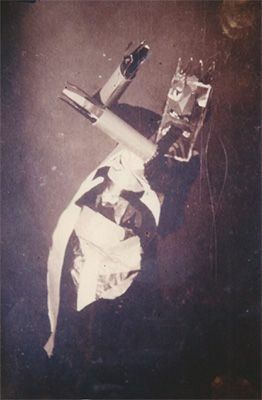 The photograph is the only visual evidence of Taeuber-Arp's activity as a dancer and one of the very few existing photographs of early Dada performance. Scholars debate if it was taken in 1916 at the Caberet Voltaire or in 1917 at the Galerie Dada, and who made the costume and mask. Regardless, it represents an important and prolific part of Dada activity. It has been theorized that the ambiguity of the photograph's reference - when and where it was taken - is what makes it such a fine example of Dada dancing. It is impossible to fix the meaning of the image or the figure, allowing every viewer to experience, and interpret, it for themselves. 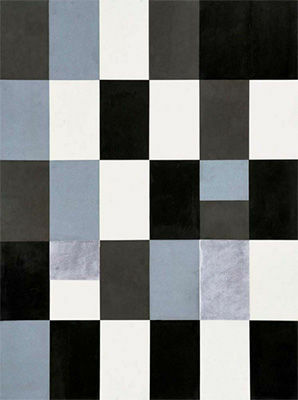 Artwork description & Analysis: This work is one example of a set of compositions that Taeuber-Arp and her future husband Hans Arp produced from about 1916-18. These works are formally characterized by strictly vertical-horizontal geometry. They are paper squares arranged to form a precise collage - the pair even used a paper cutter to do away with any trace of the human hand. The impersonal geometric forms signified the pure, the absolute, and the infinite. Although this work is simple and private - it was never exhibited in Taeuber-Arp's lifetime - it radically upends notions of making, gender, and the meaning of art. Taeuber-Arp and Arp produced these works together so closely that is impossible to tell who made what - did Arp design and Taeuber-Arp execute? Did they make decisions together? Did they take turns? 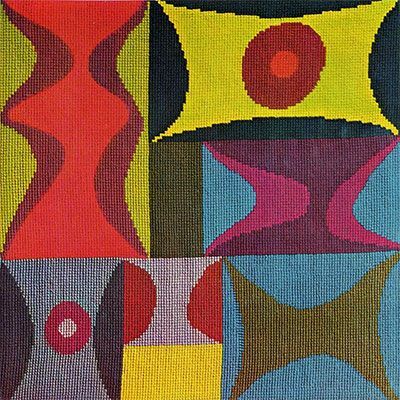 For Arp, it was radical for a man to work in a quiet medium linked to design; for Taeuber-Arp, a woman establishing herself as a textile designer, it was radical to create fine art. Yet the Duo-collages hover in-between fine and applied art - it is unclear whether the artists imagined them framed on the wall or patterning a sofa. This fluid nature and the tensions found in vertical-horizontal compositions crop up in the artists' other works in following years. This generative, private act enabled an equal partnership at a time when even the radical rhetoric of Dada had not led to real gender equality. It escaped bourgeois commercialism and allowed them to marry their fine and applied art backgrounds. In the 1930s, Arp would claim these experiments importantly, their process removed individual egos from the creation process, thus questioning the place of the artist in artistic production and dismissing the idea of the sole genius. 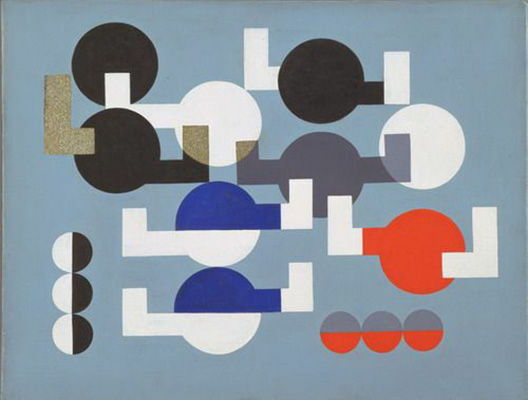 Artwork description & Analysis: Taeuber-Arp was one of first intermedia artists, and here she applies a hard-edged geometric abstraction with Constructivist tendencies to interior design. Applying the visual language found in works on paper to the walls and ceilings of this leisure complex brought the Utopian ideas behind abstraction into practice to create a space of universal harmony and beauty. Taeuber-Arp collaborated with her husband Hans Arp and fellow avant-garde artist Theo van Doesburg from 1926-28. Their collaboration shared responsibility without hierarchy, just as they removed hierarchy from design of the café - for example, the tables and chairs are as important as the wall decoration. The unity of the space and strict geometry is remarkable, and greatly contrasted with interior design styles at the time. Labeled as "degenerate art" by the Nazi Party, the space was destroyed within a decade of its creation. 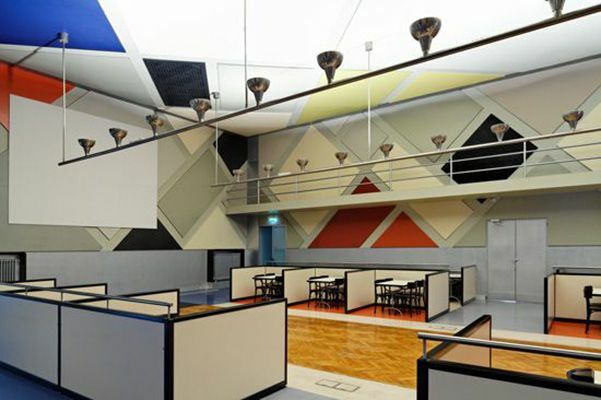 It was the first modernist space that sought to unify form and function, predating Bauhaus. The space was called the "Sistine Chapel" of abstract art, and in 2006 was restored as shown in this photograph, at a cost of 1.34 million euros. 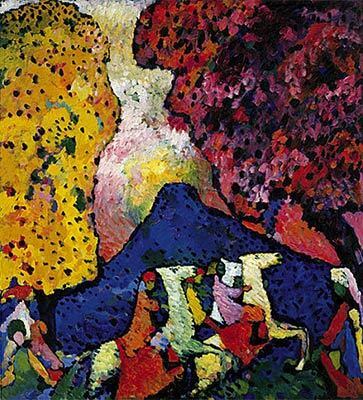 Artwork description & Analysis: The overlapping hard-edged geometric forms emphasize Taueber-Arp's allegiance with the Circle and Square (Cercle et Carre) group of artists, founded the same year as this painting. Circle and Square artists favored geometric abstraction over the contemporary Surrealist movement. In the image, Taeuber-Arp pursued inventive design that played form and color off each other to create tension, but at the same time integrated opposites to reflect an absolute harmony. This composition displays the aspiring purity of the Constructivist mode that sought the absolute and the non-human through geometric forms. The complex interplay of basic colors balances a series of oppositional composition choices: black and white, circle and square, red and blue. Far from static, however, these forms hover and interact in a dynamic equilibrium. This painting shows how Taeuber-Arp worked in the traditional art mediums as well as less traditional mediums, and how she translated compositional principles such as the vertical-horizontal application of the grid in applied arts to painting. First published on 11 Feb 2016. Updated and modified regularly.